We descend into and climb out of our last two of the North Yosemite Backcountry's famous Five Canyons, Matterhorn and Virginia Canyons. We drop down into a vast valley scooped out of the top of the vast granite ridge dividing Matterhorn from Virginia Canyons. At the bottom of this hanging valley we cross amazing lengths of a huge unjointed granite slab Spiller Creek flows across into Virginia Canyon. Gazing East at the Sierra Crestline to the North of Sheep Peak we are looking over towards the Green Creek and Virginia Lakes Trailheads within the Toiyabe administerd Northern section of the Hoover Wilderness. These trailheads are perfect start points for trips into the North Yosemite Backcountry hiking into the top of Virginia Canyon via Summit Lake. To the South of Sheep Peak the Eastern Flank trailheads in the Hoover Wilderness are administered by the Inyo National Forest. The trailheads at Lundy Lake and Saddlebag Lake offer access to the cross-country and climbing routes up to the top of Mount Conness, but not over to the Yosemite Backcountry on the West flank of the Sierra Crestline. I always camp at Glen Aulin. The PCT-TYT trail South of the Return Creek ford as depicted on the map above is wrong. Its depiction of the trail looping North from the ford before turning South has been rerouted to hike directly South from the Return Creek ford and campsites downstream along the East bank of Return Creek. Following our Southbound ford of Return Creek the Southbound PCT-TYT is depicted climbing towards McCabe Lake trail junction after making a big loop to the North, then crossing McCabe Creek well above Return Creek. This is not the route as of August 2012. The trail follows along Return Creek down to and past where McCabe Creek flows in. The fording spot for McCabe Creek is currently located where McCabe Creek merges with Return Creek, not above the junction as depicted on the map above. I've corrected the route as well as I'm able. We welcome observations which sharpen our understanding of this rerouting. Scroll East, to the Right, to reveal Bridgeport on Highway 395. We can see Twin Lakes is very close to Bridgeport. Highway 395 Corridor is beautifully impressive. I have not yet written the Yosemite National Parks permit page. But I will offer some advice. Correction: see the link above... but the advice is still good. Want to hike the JMT? Start at Sonora Pass. Drop down to the Valley backwards on the JMT once you arrive at Tuolumne Meadows, then reacquire the JMT in Lyell Canyon via the Merced River up to Voglesang. Or start into Rancheria Creek down Kerrick Canyon from Twin Lakes on Highway 395 a few miles West of Bridgeport. South of Highway 108, North of Highway 120. 15 degrees East of True North. 14 degrees 30" East of True North. For our "General Welfare" we have set up geographic organizations to provide reliable data for us all. Also included are the National Weather Service. Do that with "small" government. We'd be better off with a small corporate nobility, and a government sufficient to force them back under democratic constitutional control. There is absolutely no reason to buy maps, if you can swing an inkjet printer, some cool waterproof paper, an internet connection and a computer. Move the US Map to the Sierras. Focus in on the area of your trip or trip planning. Click "Mark Point" in controls to see the USGS map grid of the range of USGS map scales available. Select scale of Maps you wish to download. Select your 15 and 30 minute maps to download. Download the suckers! 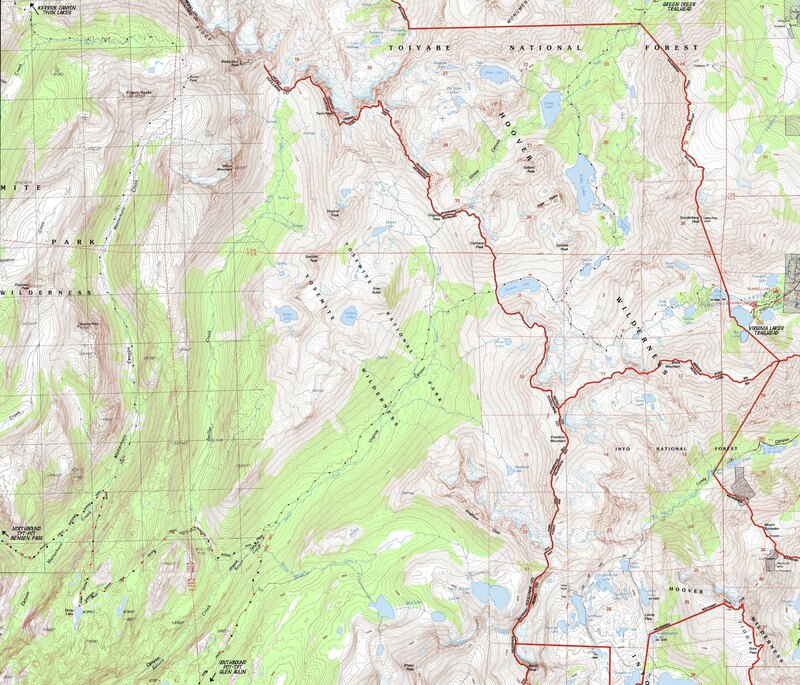 Open these free USGS maps in the free Adobe Reader. "Take a snapshot" of the map segments you need and paste them into the free "MS Paint" program that came with your "Windows" operating system to make adjustments to the map and add your own custom route indicators, then print that sucker up. You might have to screw around getting the scale and adjustments down. Make some test prints before you use your good paper! !